American horn section made famous by their backing of virtually all of Stax Records recordings with horn work. 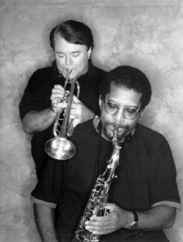 Originally a sextet led by Wayne Jackson and Andrew Love, the Memphis Horns eventually became a duo with Wayne Jackson (trumpet) and Andrew Love (tenor sax). This includes horn work with Otis Redding, Sam & Dave, & Isaac Hayes. Their long credential list also includes backing various acts such as Elvis Presley, The Doobie Brothers, Neil Diamond, & Al Green. In 2012 the Memphis Horns received a Grammy Lifetime Achievement Award for outstanding artistic significance in music. great funk bank, such a shame as of 2017 only two albums reissued on CD.